As shown in a previous installment on running the Nelder-Mead optimization of the Rosenbrock function in TI-84, its hardware is not up to the challenge for problems of this kind. It is however an interesting case to learn from this program that took a considerable amount of time (in minutes), when most TI-84 programs complete in seconds, to grasp the technique in writing optimized code. Two techniques were used to try to optimize the code. The first one is to in-line the function (in this case the Rosenbrock function). In the original version this function is stored in a string value to be evaluated whenever necessary by using the TI-84 expr() function. The idea from common in-lining is borrowed to see if it works in TI-84. As shown in line 44 below, the Rosenbrock function replaced the original expr() function call. Another technique is to remove unnecessary comments. For most modern languages this is never considered a problem but for simple calculators it is speculated valuable processing time may be spent on processing comments that contribute nothing to the algorithm. Both programs returned the same results. To compare the gain in speed, the same set of initial parameters and tolerance were used in both the original and code-optimized program. Surprisingly, the inline method does not yield any gain while removing all those “:” that were used for indentation does improve the speed. The average of the original program is 183 seconds while the program with cleaned code is only 174 seconds, which is around 95% of the run time of the original program. This entry was posted in calculator, Optimization, TI-84 Plus Pocket SE and tagged calculator performance, code optimization, inline function, Nelder-Mead, Rosenbrog, TI-84 on June 19, 2016 by gmgolem. Unlike the more sophisticated TI-89 and Nspire, the Durbin-Watson statistic is not included in the TI-84. Yet, calculating it is fairly straight-forward using list functions. Finally, run the formula below for answer. This entry was posted in Statistics, TI-84, TI-84 Plus and tagged Durbin-Watson, linear regression, regression, TI-84 on June 12, 2016 by gmgolem. The program is implemented in the native TI-Basic, which is ported from the program for the same problem previously done on TI Nspire and Casio fx-9860GII. It took some efforts to port the program as the resources on the TI-84 is comparatively limited. For example,variable names are also restricted to single character, but thanks to list, things are easier. With the availability of the new generation TI-Connect software, the Program Editor has returned and this tool greatly helped programming the Nelder-Mead on TI-84. Although unlike the more advanced Nspire Software which is able to run the program on PC instead of having to download the program to the TI-84 every time, editing TI-Basic in PC with a full keyboard and full screen is way more comfortable than to doing so on the calculator. 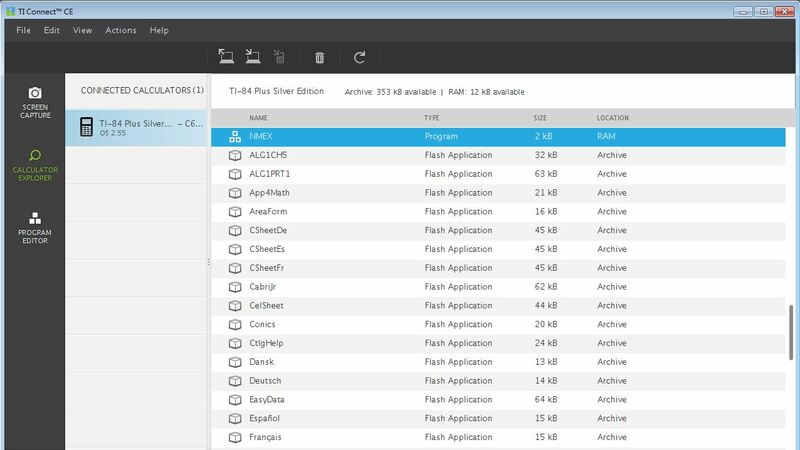 The new TI-Connect CE PC software looks really nice. Screens of the actual program running on a TI-84 Plus Pocket SE. The equation to solve is the Rosenbrock function of f(x,y) = (a-x)^2 + b(y-x^2)^2, using a=1 and b=100. The TI-84 Plus Pocket SE took 12 minutes to complete, while its big brother TI Nspire took only 22 seconds. This entry was posted in calculator, Optimization, TI-84, TI-84 Plus, TI-84 Plus Pocket SE and tagged Nelder-Mead, optimization, TI-84, TI-84 Plus Pocket SE, TI-BASIC on July 11, 2015 by gmgolem. Advanced feature like multiple linear regression is not included in the TI-84 Plus SE. However, obtaining the regression parameters need nothing more than some built-in matrix operations, and the steps are also very easy. For a simple example, consider two independent x variables x1 and x2 for a multiple regression analysis. Firstly, the values are input into lists and later turned into matrices. L1 and L2 are x1 and x2, and L3 is the dependent variable. Convert the lists into matrices using the List>matr() function. L1 thru L3 are converted to Matrix C thru E.
Create an matrix with all 1s with the dimension same as L1 / L2. And then use the augment() function to create a matrix such that the first row is L1 (Matrix C), second row is L2 (Matrix D), and the third row is the all 1s matrix. In this example we will store the result to matrix F. Notice that since augment() takes only two argument at one time, we have to chain the function. The result of F and its transform look like below. See also this installment to determine the correlation of determination in a multiple linear regression settings also using the TI-84. This entry was posted in TI-84 and tagged calculator, mutliple regression, regression, TI-84 on June 7, 2015 by gmgolem. The TI-84+ Pocket SE is the little brother of the TI-84 Plus. They are almost identical in terms of screen resolution, processor architecture and speed, and also the OS. The Pocket version measured only 160 x 80 x 21mm in dimension and weighted at 142g, considerably more compact than the classic version. This little critter is full of features from the 2.55 MP OS. It will easily blow away the mainstream Casio series of the same size like the fx991 and even fx5800P with TI’s built-in advanced functions like ANOVA. 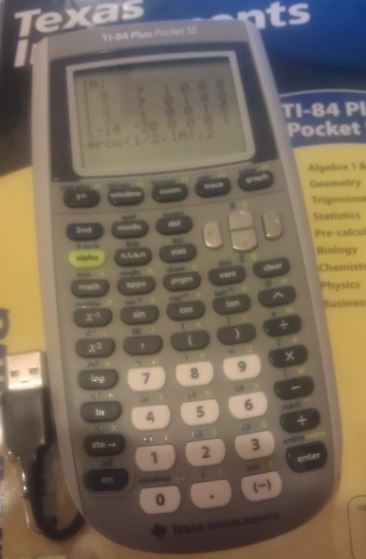 Nevertheless, the TI-84 Plus series is still considered a stripped down version of the TI Nspire and TI-89 Titanium, and as such personally I do not expect or intent to run on it sophisticated calculations or programs like the Nelder-Mead algorithm that fits comfortably on the Nspire or Titanium. Using the *row() and *row+() matrix function, the Simplex Algorithm can be implemented without even one line of code. The final answer is obtained as 11200 which is the maximum profit by producing 200 Product A and 400 Product B. This entry was posted in production planning, simplex algorithm and tagged calculator, optimization, TI-84, TI-84 Plus Pocket SE on June 6, 2015 by gmgolem.